I love multipurpose beauty products–balms that work on both eyes and lips, creams that do double duty as blushes and lipstick…you get the idea. One of the winter trends that I am most stoked about this year is reversible outerwear. Yup, you read that right…coats, jackets, and vests that you can turn inside-out for multiple looks. How great is that? It’s like two holiday gifts beautifully wrapped up into one. Take a look at some of the most fetching reversible cloaks currently in stores. Some are perfect for snowy getaways; others for more fair-weathered ways. 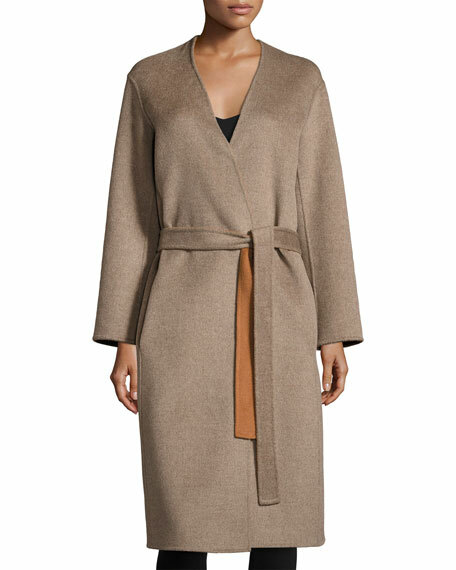 This Reversible V-Neck Camisole Coat from Vince offers four distinct looks: One belted in sepia; one belted in a light heather hue; one unbelted in sepia; and one unbelted in heather. You can’t ask for more. $795.00. http://www.neimanmarcus.com. I love this Blue Duck Reversible Genuine Sheepskin Coat. Classic in style and length, this is one you can wear for years. Although not inexpensive at $1,499.00, it is well worth the dough. http://www.nordstrom.com. LaMarque’s Reversible Lamb Leather Metallic Bomber Jacket boasts one side in a rose gold finish and another in black leather. $515.00. http://www.neimanmarcus.com. 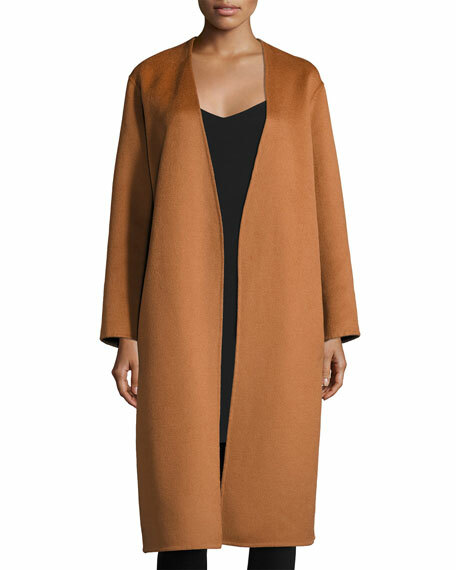 Zara’s reversible contrast coat comes in tan (shown) and black. $129.00. http://www.zara.com. The Donatella Reversible Dot Pleat Hood Packable Raincoat from Mycra Pac Designer Wear scrunches up into its own travel bag. The shimmery dot shell reverses to a solid side. Available in blue and black, it sells for $258.00 at http://www.nordstrom.com. Burberry’s Scottish Tartan & Cashmere Coat Reversible Coat sells for $2,895.00. http://www.nordstrom.com. Looking for something sporty. Blanc Noir’s Reversible Puffer Coat might just fit the bill. It retails for $279.00 and can be found at http://www.nordstrom.com. 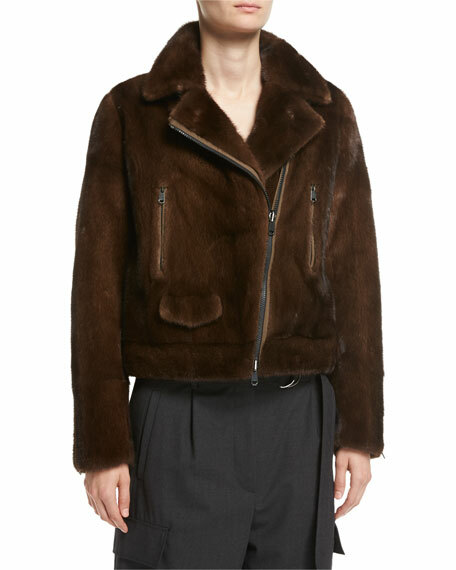 For the dreamers in all of us comes this reversible mink bomber jacket from Brunello Cucinelli. 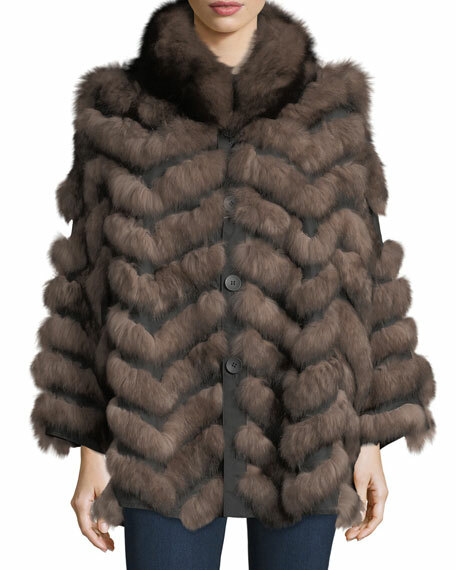 I bet we can find a faux fur option that sells for a lot less than this one, which retails for…don’t faint…$23,495.00. http://www.neimanmarcus.com. Zara’s reversible kimono jacket features one side in a brown faux fur and another in a floral pink print. $129.00. http://www.zara.com. Like to layer? This reversible vest from St. John Collection is just the ticket. One side is in travertine; the other is stone. $1,195.00. http://www.nordstrom.com. 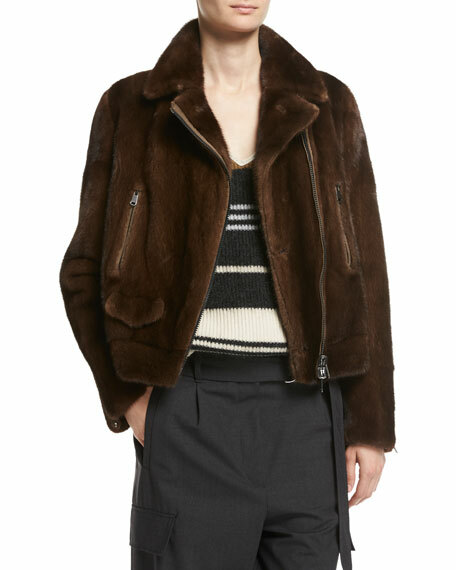 If you are not put off by fur, this reversible fur trim coat might be just the ticket. Featuring a chevron pattern of real dyed-fox from Finland, it retails for $995.00. http://www.neimanmarcus.com. This is probably the one that I would love to get. Hey, Santa, I’ve been good this year! Elizabeth and James “Willa” Bomber Jacket reverses from black to pink. Currently on sale for $183.20. http://www.neimanmarcus.com.